A few days ago I was looking at my website statistics and two thoughts came to mind. The first was, why are my Blogger statistics and my Google Analytics statistics so different? They are both run by Google so it is only reasonable to assume that they measure the same data. I wishfully trust the Blogger statistics as they show about 900 visitors per month over the past three months, whereas Google claims that I've had only about 300 visitors per month over the same time. I'm not going to discuss this thought, but if you would like to continue reading about this conundrum, go check out Steve Heimoff's post on a very similar question from January. However, while looking at these statistics I noticed that many my most popular posts were about my experience with the Society of Wine Educator's certification program that I went through. I then realized that I had not posted about my results. And with the interesting conversation over on Twitter a few weeks ago with Lenn Thompson, Joe Roberts, Steve Paulo and Joe Herrig, I thought I should report on my results and discuss other wine certification options. Unfortunately for me, but fortunately for you, Mr. Roberts posted an excellent vlog about wine certifications over at 1WineDude.com. So here, I attempt to put into written word, without plagiarizing, what the amateur-gone-pro has done via multimedia. As Joe Roberts said in his video, there are only three widely recognized wine certifications programs. These are, in no particular order, the Court of Master Sommeliers (CMS), the Wine and Spirits Education Trust (WSET), the Institute of Masters of Wine (IMW) and the Society of Wine Educators (SWE). Each has a different purpose, audience and variety of levels. If you are thinking about obtaining one or more of these credentials, think about why you want a certification. Do you need a certification for a job? Are you an enthusiastic consumer that just wants to have a structured environment in which to further your wine knowledge? Are you looking for instant credibility for your winery or wine blog? I'll be honest and admit what most other bloggers won't and say that part (not most) of my desire to obtain a certification was to have a bit of credibility for my new wine blog (yes, the one you are currently reading). However, most of my motivation involved my two paying jobs. I work in the wine industry as a part-time staff member of the Colorado Wine Industry Development Board. I thought having a some type of credential would help me in my work with Colorado's winemakers and grape growers. Turns out not many of them are familiar with or a care about highfalutin wine certifications. However, my other job is as an adjunct instructor at my alma mater (and current school for my Ph.D. work), the University of Denver (DU). I currently teach a sequence of environmental science courses but secretly (or maybe not so secretly) desire to teach a Geography of Wine course. Degrees and credentials are important in the field of education and a wine-related certification may go a long way to convince the powers that be to let me create a wine course. Thus, the obvious choice of certification would be offered by the aptly named Society of Wine Educators. For this reason, I decided to embark on the journey to become a Certified Wine Educator (CWE). The first stop on this journey was to become a Certified Specialist of Wine (CSW). This certification is based on the results of a 100-question multiple-choice exam and "recognizes a high standard of academic wine knowledge and the mastery of key elements within the world of wine and vine as determined by a team of wine industry educators." As I explained in previous posts, I purchased the 214-page SWE CSW Study Guide, access to the online SWE wine academy and browsed through my collection of wine books on loan from the DU library. I studied for about six weeks before I was scheduled to take the exam here in Denver. After the exam, I waited another six weeks for the results and was proud that I passed with a score of 91/100. While I would not call the exam easy, I would say that the 75% passing level could be achieved by most people with a moderate amount of wine knowledge and lack of test anxiety. The next level of wine certification from SWE is the CWE. From what I can tell, this entails a much greater level of knowledge and ability. While a shorter multiple-choice exam is still part of the process, an essay question, a varietal wine identification tasting, a wine components and imbalances tasting, a wine presentation skills demonstration AND proof of responsible alcohol service certification (such as TiPS) are required. This level of assessment "recognizes a fluid ability to draw comparisons and recognize contrast within and between the various wine regions, grape varieties and wine styles of the world from both a theoretical and practical standpoint." When you see CWE next to someone's name, you should expect to meet a person with excellent knowledge about wine and the ability to educate others about it. One my 2011 goals is to complete the CWE certification (along with hoping they offer an exam in Denver!). For those of you in the service part of the industry, the Court of Master Sommeliers might be more appropriate. The ultimate credential offered by this organization might be the most well-known wine credential in the United States. The focus of this program is not only on academic knowledge but also on professional wine service. Yet, before one becomes a Master Sommelier three other levels must be achieved. The first, the Introductory Sommelier Course and Exam, is "given over a two day period with candidates receiving intensive review, instruction and training by a team of Master Sommeliers on wines and spirits knowledge, proper wine service, and blind tasting." This program is concluded with a 70-question multiple-question theory exam with only a 60% score needed for passing. The second level exam consists of a blind tasting of two wines, a written theory examination, and a practical service examination. Again, the required score to pass this level, and obtain the Certified Sommelier designation, is 60%. If a candidate has passed both the Introductory and Certified Sommelier exams, and has at least five years of wine service experience, he or she may apply for the Advanced Sommelier Course. Three days of intensive lectures by Master Sommeliers are followed by a two-day exam in which candidates must present practical wine service, a written theory exam and a blind tasting of six wines. Candidates pass this level with a minimum score of 60% on each of these three sections. At this point, candidates may be invited to take the Master Sommelier exam. This final assessment is similar to the Advanced exam except that the theory section is oral and the passing grade is 75% on all three sections. Once this is achieved, the title of Master Sommelier is bestowed. Only 180 individuals in the world can lay claim to this title. 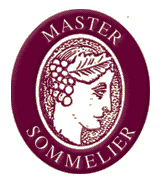 Perhaps most prestigious credential in the world is given by the Institute of Masters of Wine (IMW) based in the U.K. However, the unofficial feeder program for those wishing to become a Master of Wine (MW) is the WSET, also U.K.-based. Again, the WSET has a variety of levels of qualification. The entry level, 1-day Foundation Certificate provides basic wine knowledge. A total of 70% correct on the 30-question multiple-choice exam is required to achieve this level. The level 2 Intermediate Certificate in Wine and Spirits provides vocational training and is assessed with a 50-question mutliple-choice exam, with a mark of 55% considered passing. The third level, Advanced Certificate in Wine and Spirits, is a more detailed program that requires a 55% grade on a 50-question multiple-choice exam, two essay questions and a blind tasting of two wines. The fourth level, Diploma in Wine and Spirits, is the WSET's flagship qualification and is considered a stepping stone to the MW credential. This program is divided into 6 units and participants must pass each unit with a minimum score of 55%. After obtaining this distinction one should have "expert knowledge of the principal wines and spirits of the world combined with commercial factors and a thorough system for the professional evaluation of wines." After earning the WSET Diploma, the IMW offers the MW program that "promotes a cross-disciplinary approach to understanding wine at the highest level" that only 288 others have achieved. Finally, groups like the International Wine Guild, the International Sommelier Guild and even Wine Spectator and Robert Parker's Wine Advocate are offering their own wine certification programs. While these programs provide a structured learning environment that may suit your needs, they are in a different league than credentials from the big four mentioned above. Like with all things, a savvy consumer will consider bang for the buck, so if you are interested in earning a wine credential, do yourself a favor and do some research. Go to each organization's website. Ask people with credentials what they think. If you're going to be spending your hard-earned money and valuable time on these post-nominals, find the program that is best for you. The CSW (Certified Specialist of Wine) is becoming a widely recognized credential in the wine industry, with many of the top companies actively participating in the program, including Banfi Vintners, E & J Gallo Winery, Empire Distributors, Kobrand Corporation and Southern Wine and Spirits to name a few. That's why I chose the CSW! Did you ever decide to go for the CWE? I have not done so yet, but may in the future. Interesting blog! Thanks for posting your experiences with the process. I thought I was somewhat knowledgeable about wine, but I only knew 1 or 2 of the answers on your sample tests! I'm thinking about pursuing this credential as a prelude to opening a wine shop, but I've got to do some reading and studying!